Fish Finger Sandwich: Retro Biscuit Ice Cream - "Jaffa Cake"
Retro Biscuit Ice Cream - "Jaffa Cake"
It's not a clear-cut thing. The sponge layer is probably more cakey than biscuity, but the size and format are more biscuit-like. But either way, it seemed like a great candidate for another Retro Biscuit Ice Cream. 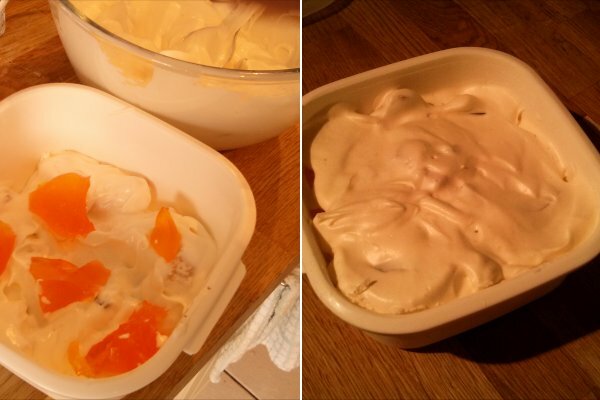 I was pretty impressed with the Angel Delight ice cream mix, so I decided to use it again for the Jaffa cake ice cream. The biggest unknown was the orangey bits - this was clearly going to be rather experimental. 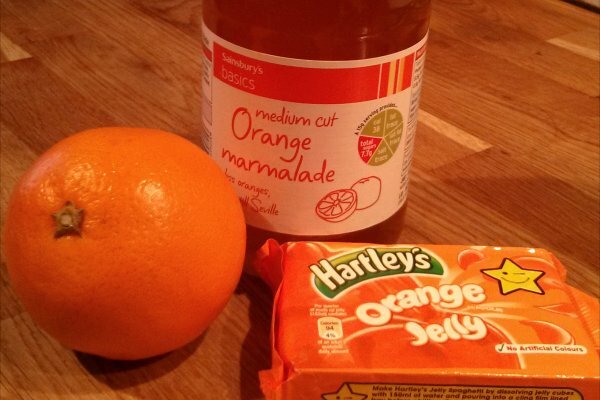 I considered several approaches, but eventually settled on using orange jelly. 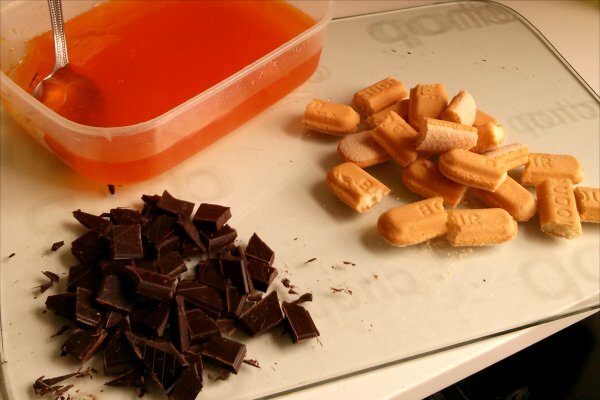 I made a rather more concentrated solution that the packet recommended, and as well as water, I used the juice of two oranges along with a couple of spoons of marmalade. Sponge fingers seemed like the obvious choice to represent the firm-yet-spongy Jaffa cake base, and obviously I was going to need some chunks of dark chocolate. I made up the ice cream mix, stirred in some blobs of jelly along with the sponge fingers and chocolate, and put the whole lot in the freezer. Overall this was a pretty good effort. The sponge finger pieces had soaked up some of the ice cream, and tasted great as a result. The orange jelly was pretty interesting, and came out like pieces of slightly squidgy orange ice lolly. 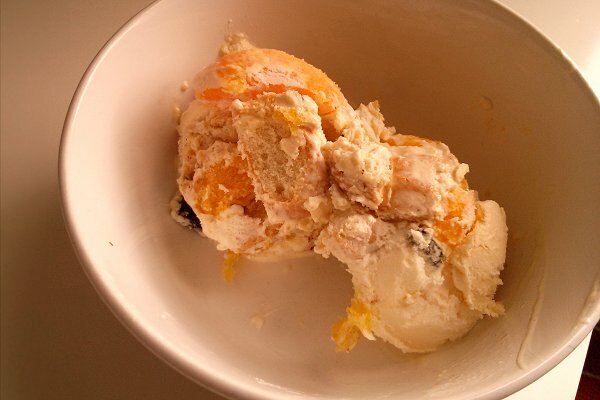 The large pieces of sponge finger and orange jelly made it hard to scoop it out in an even shape, so there is certainly some room for improvement. But overall, a solid addition to the series. 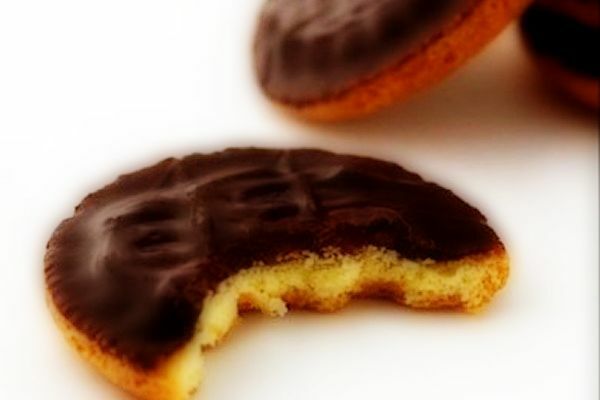 Noticed in a flyer that Asda are doing Bourbon biscuits ice cream sandwiches along with some other old school biscuits.